Bushiroad introduces a new Eradicator from “Dragon King’s Awakenings”. AUTO [RC]: When this unit attacks a vanguard, if you have a vanguard with “Eradicator” in its card name, this unit gets Power +2000 until end of that battle. 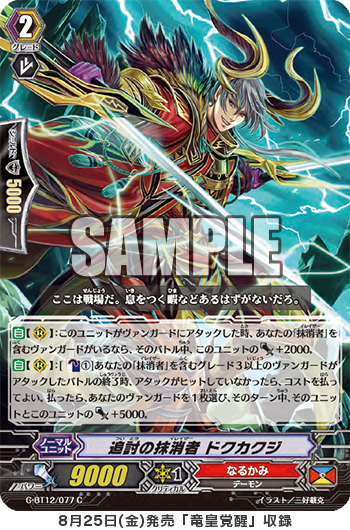 AUTO [RC]: [Counter Blast 1] At the end of the battle that your grade 3 or greater vanguard with “Eradicator” in its card name attacked, if that attack did not hit, you may pay the cost. If you do, choose one of your vanguards, that unit and this unit get Power +5000 until end of turn. • From the Clan Booster “Prismatic Divas” (on sale July 7th), 《Bermuda Triangle》’s “Riviere” SP Clan Pack. • From Booster 12 “Dragon King’s Awakening”, “Pursuit Eradicator, Dokukakuji” who bolsters 《Narukami》’s “Eradicators”. The “Riviere” SP Clan Pack contains Riviere of every Grade! This product contains all the Riviere of each Grade you need to support “Legendary Idol, Riviere”, so get your hands on it! If you manage to, aim to build a Riviere Deck! The 《Narukami》 “Pursuit Eradicator, Dokukakuji”, when it attacks a Vanguard, and your Vanguard is an “Eradicator”, it gains Power+2000, making it capable of 11000 Power attacks! And, when the attack of an “Eradicator” Grade 3 or higher Vanguard fails to Hit, the Vanguard and itself gain Power+5000! It’s a card that works perfectly with “True Eradicator, Dragonic Descendant “Zillion”” who can Stand when its attack fails to hit! And since it has no Generation Break, it also works perfectly fine with “Eradicator, Dragonic Descendant”! From today onwards, for “Today’s Card” we’ll be introducing cards from the 5th Clan Booster “Prismatic Divas” and the 12th Booster “Dragon King’s Awakening”! Please enjoy!